The aseptic filling market is exploding, with a variety of applications in terms of fill sizes, vial types, and compatibilities. The unique issue that is complicating the selection of systems is the batch sizes that are being filled. Phase 1 products, cell and gene therapies, and orphan commercial products have batch sizes as low as 100 vials and up to 1,000. Development facilities and manufacturing sites cannot usually justify buying one filling system for each product or presentation. Additional challenges arise as those small volume products grow geometrically in the market due to increased indications. The vial filler that provided us success at 500 10R vials to a batch cannot be used when the batch size becomes 100,000. The industry also continues to depend on CMOs and expects them to have infinite capability and be able to react quickly. The reality is that the CMOs generally are legacy Big Pharma sites with antiquated, oversized filling systems that are not up to current technology. Adapting short fill cycles to large systems is costly and extends the time frame to a precarious level. CMOs’ filling technology in most cases may be acceptable for the FDA; however, they are not in compliance with the newly revised EU Annex 1 and Annex 2 guidelines. As an industry, we are being challenged to do more with less. Flexibility is a constant theme, whether it is managing an existing facility or designing a new one. As we juggle existing product portfolios and consider the “what ifs” of the future, we may find a point where we ask ourselves “Are we asking too much of our filler?” We need to get our heads out of the sand and ask also whether we are asking too much of our CMO’s filler and why moving our obvious problem from our plate to someone else’s is a good idea. The following discussion will look at new technologies that break the old filling paradigm. The introduction of “ready to use” components broke the first and oldest model of “old pharma.” No longer would every fill line have to have autoclaves, vial washers, sterilizing tunnels, and the myriad of mechanical handling equipment that introduces line failure and sterility risk into the process. The allure of ready to use (RTU) stoppers, caps, seals, and vials in terms of a reduced facility footprint is a great advantage and certainly reduces risk, but it often locks us into a small set of commodities. Many facilities have a problematic commodity, a legacy product, or a quality control issue with the supply of a commodity that could be solved by having it processed by an outside source that has greater skill. Allowing West Corp. to clean, silicon, and sterilize stoppers makes a lot of sense. This becomes true for seals, vials, etc. This solves one problem of quality but puts yet another supply chain burden on the product, along with cost. The trade-off off flexibility and speed is ever present, but the quality aspect should push in favor of the correct choice. Of course, the ultimate flexibility is manual filling, as discussed in a previous article (“Manual Aseptic Processing: The Last Resort or the Best Approach”). Robotic fillers that fill nested formats allow multiple commodity types since the nest provides the support/positioning for the commodity. Fillers processing bulk commodities face limited ranges for container dimensions and fill volume. The following case studies help illustrate the applications of technologies and new commodities to solve perplexing filling problems. A CMO was producing products at small scale in everything from plastic microtubes up to 30-ml glass bottles with both screw tops and stoppers. It was running several small and varying batch sizes (60 to 5,000 units per day) while switching commodities between batches. A proposed filler that could process this array of products faced extensive line changes over time to handle the different components across the product portfolio and had a substantial capital cost (machine and floor space). The plant was using bulk sterile bags of plastic tubes that would typically be loaded via a descrambler and sequenced into the line. Alternatively, the presterilized bulk glass vials and bottles would be removed from the container tray on to an accumulation table into a belt conveyer. These alternate feeds could have been installed to feed a common belt. Different conveying methods were required, as micro tubes are unstable and require an external support, while most vials and the 30-ml bottles could stand up. The differences in the coefficient of friction of glass/plastic and acceptable handling forces would require extensive changes in the conveyor between runs for the non-micro tube components. Screw caps can be received in two formats: with caps independent of the container or with the cap on the containers (which need to be removed and reapplied). For screw caps that are independent of the container, there is the possibility of having the screw top and stoppering station be the same location with a tool swap. There are machines that can be designed for tool changeover at the closure station to allow screw tops or vials. The complexities of the product portfolio led to analysis of the production to drive rationalization of the filler requirements. In this case, the analysis showed the majority of both number of runs and units produced were in a tight volumetric range of plastic screw tops. Solution: Plastic screw top filler and manual fill of other commodities. A biopharmaceutical manufacturer was designing its facility of the future for clinical supply. Its current products were in bulk vials with a mix of lyophilized and non-lyophilized products. It was developing products that used syringes, and it faced the problem of not wanting to exclude the syringe products from the new line, but not wanting to invest in a combination line up front. In addition, the initial products in the development pipeline were not lyophilized, so it wanted to defer the investment in a lyophilizer. Designing the clinical filling line to have the flexibility to accept a wide variety of tubed components or bulk vials and the ability to add lyophilization in the future led the company to an isolated modular fill line. The first module would prepare bulk vials utilizing a washer and depyrogenation tunnel. Wrapped, empty vials will be brought into the room to be unwrapped and loaded into a washer that will rinse off residual particles from inside and outside the container. The washer will be a continuous, fully automatic machine. The outfeed of the washer will transport the vials directly to the depyrogenation tunnel, which will achieve a minimum 3-log pyrogen reduction for the vials as they pass through unidirectional HEPA-filtered hot airflow. The tunnel will control flow of vials in a pack and consists of heating and cooling zones, such that the vials exit at an ambient temperature condition. The depyrogenation tunnel will discharge vials into the isolator on the accumulation table in front of the filling line. The tunnel will have a cool zone sterilization cycle to periodically sterilize the cooling zone portion of the tunnel. In the case of tubbed components, the filling line will be outfitted with the appropriate change parts and modules to facilitate tubbed component infeed. Specifically, another module was added to provide a feed downstream of the bulk vial feed into a fill line, bypassing the vial preparation module. Tubbed components will be manually loaded on the infeed conveyor by an operator and will be transported to a semi-automatic debagging zone where the outer bag of the tub will be removed with a restricted access barrier system (RABS). Following bag removal, the tubs will be admitted to the isolator zone and the lids will be removed. The tubbed components will be transported to the downstream filling module for further processing. Drug product filling will be performed on a filling machine within an aseptic barrier isolator. The filling line will receive nested vials, syringes, or cartridges from the infeed module or bulk vials from the depyrogenation tunnel outfeed. The filling line will include an in-process check-weigh function performed on 100 percent of the containers to assure they are filled with the proper weight. Filled containers will be closed and/or capped before exiting the filling machine onto a tray-off station. Separate rapid transfer ports (RTPs) will be provided for stopper/plunger and crimp cap introduction into the isolator. Formulated product in a single-use bag will be connected to the filling line using an RTP connector. The filling line will have the capability to fill components using peristaltic pumps. Single-use disposable (SUD) components will be used for the product path between the product bag and the filler. SUD components include aseptic connectors, product path tubing, filling needles, product filters, and gas overlay filters. Additional features will be included, such as an inert gassing system after filling, missing stopper detector, missing cap detector, and non-viable particulate monitoring and viable sampling systems at the filler. The configuration for this clinical filling line adds a provision for one freeze dryer. The freeze dryer will be configured with a loading slot door on the isolator side and a full-size hinged door on the opposite side. The loading side of the machine mates to the isolator, while the remainder of the chamber will be located in the technical area. Loading and unloading of the freeze dryer will take place through the slot door on the filling line side. Solution: An isolated modular filling line allowed for flexibility in processing different presentations and enabled deferred capital spend. A CMO was adding filling capacity for a novel cell therapy in Phase 2 clinical trials that used closed vials. Concerns were raised early on about the consequences of the product not making it to commercial production, as this was the only product in the portfolio that used closed vials. Traditional aseptic vial filling requires a substantial system of a vial unloader/feed system, washer, sterilizing tunnel, unscrambler, filler, sealer, capper, and tray loader. This array of equipment at any level requires a substantial investment and a large physical footprint. With closed vial filling, the system consists of a small isolator/RABs booth with an infeed and outfeed tray system. The entire operation is contained in an enclosure the size of a biosafety cabinet. Closed vial filling provides “ready to fill” presterilized (gamma irradiated) tubular extruded polymer vials sealed and crimped around the vial edges. The seal is made to be penetrated by a sharp vial filling nozzle and then resealed by either a laser or an ultrasonic welder. This is all done in the confines of a small enclosure, with the peristaltic filling pump inside the enclosure and an aseptic connection to the external bulk product bag. The computer controlled filling is done by a robot that coordinates the overhead penetration of the vial seal with the peristaltic pump providing the fill dose. After the dosing into the vial, the robot changes its articulation from the filling head into a heat sealing head that seals each vial independently and quickly. 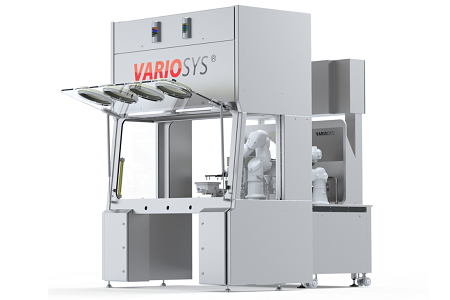 Robotic lines such as these have achieved speeds of 30 vials a minute, with the typical application around 10 vials a minute. This means a batch of Phase 1 or Phase 2 vials can be filled easily during one shift. A smaller footprint is achieved, and less classified space is needed, since the entire operation can be done in an EU Grade C environment. The compatibility, extraction, and leachability studies must focus on the polycarbonate vial and the selected seal. Vials need to be ordered in nested configuration and consideration given to handling the vials before entry into the filling isolator/RABS via robot or other means. Solution: A robotic nested format filler with isolator. The isolator provided an additional level of security around closed vials and enabled traditional open filling of nested commodities if needed. These case studies represent typical industry product portfolios where the question “Are you asking too much of your filler?” arises on a frequent basis. Meeting the needs of small scale and diverse product sets is possible. The use of an isolated modular filling system provides the flexibility for clinical biopharmaceutical production and low-volume commercial applications. The addition of an isolator to a closed vial filling system adds flexibility for fillers intended for cell and gene therapies. CMOs operating diverse small scale product portfolios need to evaluate where they can met the greatest production with limited capital. Herman Bozenhardt has 42 years of experience in pharmaceutical, biotechnology, and medical device manufacturing, engineering, and compliance. He is a recognized expert in the area of aseptic filling facilities and systems and has extensive experience in the manufacture of therapeutic biologicals and vaccines. His current consulting work focuses on the areas of aseptic systems, biological manufacturing, and automation/computer systems. He has a B.S. in chemical engineering and an M.S. in system engineering, both from the Polytechnic Institute of Brooklyn. Erich Bozenhardt, PE, is the process manager for IPS-Integrated Project Services’ process group in Raleigh, NC. He has 12 years of experience in the biotechnology and aseptic processing business and has led several biological manufacturing projects, including cell therapies, mammalian cell culture, and novel delivery systems. He has a B.S. in chemical engineering and an MBA, both from the University of Delaware.